UH Global promotes and enhances the UH brand, reputation, and community worldwide through scholarly research, experiential learning, global engagement, and strategic partnerships with the intention of creating cross-culturally diverse, successful students focused on international social, legal, economic, political, and technological issues. The International branch of UH Global welcomes students and visiting scholars from around the world to study and work at the University of Houston. Learning Abroad facilitates travel across the globe through a number of international learning opportunities, including faculty-led programs, traditional study abroad programs, research opportunities, internships, volunteer opportunities, non-credit experiential learning programs, service learning programs, and exchange programs. The Global Initiatives office facilitates collaborations around the world through strategic partnerships, scholarships, and grants. The Global Citizens Credential (GCC) allows UH students to enhance their undergraduate degrees with a set of core global competencies that distinguish them as global citizens. UH students who participate in the GCC will gain global knowledge and skills and upon completion, can demonstrate their international expertise through a certificate. 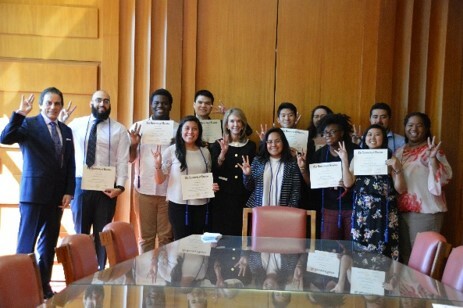 The GCC helps students stand-out when applying to jobs or graduate school and also encourages students to increase their level of global engagement and responsibility on the UH campus, within local communities, and beyond. UH students who graduate with the GCC will receive a global citizen credential transcript notation, a signed certificate, and an honor cord to wear at graduation. The GCC is open to any UH undergraduate student in good academic standing with a GPA of 2.00 or above. In order to receive the GCC, the student needs to earn a minimum of 10 points and attend a Capstone Symposium before graduation. Students can earn points through participation in any of these categories: Global Courses, Learning Abroad, Language Proficiency, Global Scholarly Work, and/or Intercultural Activities. More information about how points are awarded can be found below under ‘Earning Points Towards the GCC’. Register: Register online and sign up for the GCC list serve. Complete a Verification of Completion Form: After earning 10 points, submit a Verification of Completion form on our website to register points. Submit any documentation as needed. You may use the documentation form on our website for proof of attendance to global scholarly work or intercultural activities. Attend a Capstone Symposium: Once you are confirmed with 10 points and are in your senior year, complete the form online to register for a Capstone. Attend the GCC Certificate Ceremony: Attend the GCC certificate ceremony to receive your certificate and honor cord. If you are unable to attend the ceremony, schedule a time to come by the UH Global office to pick up your certificate and honor cord. Global Courses (4 or 2 points) Students can be awarded for either an approved global major or minor at 4 points or by taking a global course for 1 point each up to 2 points. 4 points – Successful completion of UH approved global major/minor. 2 points - Successful completion (C or higher) of two upper-level global courses from the approved list of global courses. The course list is not exhaustive and students can submit a syllabus to UH Global to determine whether a course can be approved. Learning Abroad (4 or 2 points) Students can be awarded points for a UH academic program overseas (e.g. faculty-led, reciprocal exchange, or affiliated program) or with a documented professional activity abroad (e.g. internship, research, service learning, or volunteer project). Points are given based on the length of the program. For more information about learning abroad programs and scholarships, please visit the Office of Learning Abroad. Language Proficiency (4 or 2 points) Students can be awarded points for either having a foreign language major or minor at 4 points or by taking an upper division foreign language course for 1 point each up to 2 points. 4 points – Successful completion of any foreign language major/minor. Or if a student already speaks a language other than English, the student meet with a UH faculty member who teaches the language and ask the faculty member to email us as proof of language proficiency to earn 2 points. Or a student may take a placement exam and submit documentation for 2 points. For more information about language placement exams, visit the Testing Services website. Global Scholarly Work (1 or 2 points) Students can fulfill the requirements for this category either locally, throughout the U.S., or abroad. Students must provide written documentation as proof of participation, such as an email verification by the event organizer or supervising professor/staff member or by using our documentation form below. 2 points – Participating in undergraduate research on any subject with a global focus for a minimum of four weeks or by authoring or co-authoring a scholarly work with international collaborators such as foreign embassies, multinational enterprises, non-governmental organizations, or research and development institutes. For more info about research opportunities, please visit the Office of Undergraduate Research. Intercultural Activities (1 or 2 points) Students can fulfill the requirements for this category either locally, throughout the U.S., or abroad. Students must provide written documentation as proof of participation, such as an email verification by the event organizer or supervising professor/staff member or by using our documentation form below. After completing 10 points, the student should complete a 'Verification of Completion' form by clicking the button below to submit information and documentation to register points. UH Global will verify the total points and follow up if additional information or documentation is needed. The Capstone is a three hour debrief session where GCC students share their global experiences, explore global issues and theories, discuss the effects of globalization, and reflect upon what it means to be a 'global citizen'. Students are eligible to register for a Capstone during senior year and after successfully registering 10 points. The Capstone Symposium is the final step in completing the GCC and must be completed before graduation. All Capstones will be held in the UH Global office in Ezekiel W. Cullen Building, Suite 101 unless noted otherwise. Note: Students who complete the GCC will have a $25 'Graduation Application Fee' placed on their account by the Registrar after graduation. These charges are for the processing of the transcript and certificate. For questions, please contact us at uhglobal@uh.edu. Students are also welcome to schedule an advising appointment or drop by the UH Global Office at E. W. Cullen Building, Suite 101. Any formal collaboration such as a Memorandum of Understanding, an Articulation Agreement, or a Contract between UH and a foreign institution requires the endorsement of UH Global, the Office of the Provost and, if necessary, the Office of the General Counsel before it can be implemented. The Process for Establishing International Affiliations assists UH faculty and administrators through the required steps in establishing formal collaborations. German Academic Exchange Service’s “DAAD” information tour “Germany Today” is designed to give participants a broader overview of Germany’s higher education landscape. During this tour, June 17 – June 23, 2018, a special focus will be on German Universities of Applied Sciences. Interested faculty members should contact Jaime Ortiz at jortiz22@central.uh.edu to participate. Swansea University is offering Erasmus+ faculty mobility grants for faculty from Texas Strategic Partnership universities to undertake short teaching visits to Swansea University. What is Global Strategies and Studies? Global Strategies and Studies – commonly referred to as GSS is the centralized global leadership team at the University of Houston. GSS facilitates resources and assistance for all global operations at the university, and functions as a clearing house for all formal university international business. International Student and Scholar Services, Learning Abroad and Global Initiatives reside under GSS. What does International Student and Scholar Services (ISSS) do? ISSS facilitates all aspects of accepted incoming international students, faculty and dependents coming to the university. This includes providing visa and support services related to a student’s non-immigrant status while attending the university. More information on International Student and Scholar Services. What does Learning Abroad (LA) do? LA facilitates all aspects of preparing and processing student undertaking an overseas learning program, including reciprocal exchange with partnership institutions. More information on Learning Abroad. What does Global Initiatives (GI) do? Commonly referred to as an MOU, a Memorandum of Understanding is the formal agreement between UH and another entity, typically with a foreign institution of higher education, that allows the two parties to enter into a protective state for the sharing of ideas, research, faculty and staff exchanges, and allow for free discussion on the development of specific programs. This is typically facilitated at the college level and approved at the provost level. Commonly referred to as an MOA, a Memorandum of Agreement is the formal and legal articulation of specific programs, research or directives that are the result or extension of an MOU with the same entity. An MOA is typically facilitated by GSS and approved by UH Legal Affairs. Some other variations are defined as Articulation Agreements (AA) or Addendum to a Memorandum of Understanding, which are also used for the legal articulation of specific programs, research or directives, among others. What is the process for establishing an international institutional partnership? Instructions on establishing an international institutional partnership. For any additional questions not answered here, please contact Global Strategies and Studies at gss@uh.edu.